The two senior citizens in front of me were clearly having a ball. They were, it must be said, up to their chins in the hot thermal waters of Szechenyi Bath’s outdoor pools, but more to the point, they were playing chess on a floating board and loving every minute of it! Floating chess is a popular pastime in Budapest’s thermal pools; in fact splashing around in thermal springs is all the rage here, after all, there are over a hundred of them to choose from. 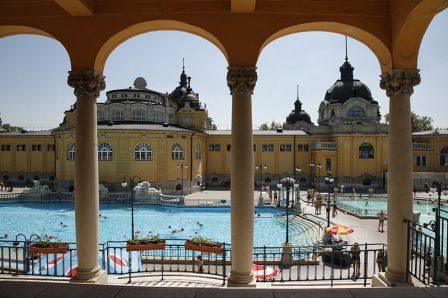 However, the historic 1920’s art nouveau hedonic splendour of the Gellert and Szechenyi public baths, and Rudas, the Ottoman inspired Turkish baths with its wonderful octagonal pools, cupolas and coloured glass windows are simply not to be missed. Hungary’s fascinating capital sits astride the legendary Danube like two temptresses, each wanting to reel you in to their individual charms. On the west side lies Buda; hillier, older and distinctly wiser than its younger sister, with its medieval castle district and fabled Gellert Hill and Citadel. 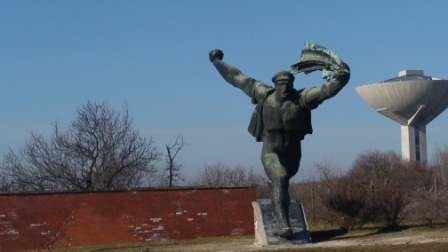 Pest on the Danube’s much flatter eastern flank, is altogether different. It is the centre of Budapest’s business, shopping and political life, but it too is not short of its own attractions with the Danube Promenade embankment providing a memorable stroll along the Danube, the imposing St Stephen’s Cathedral and the beautiful Andrássy Avenue leading to Heroes Square to name but three. In fact, with so many beautiful wide boulevards and baroque, neo-classic and art nouveau buildings, you can understand why Budapest is often referred to as the ‘Paris of the east’. So in a city blessed with a plethora of attractions where do you start? 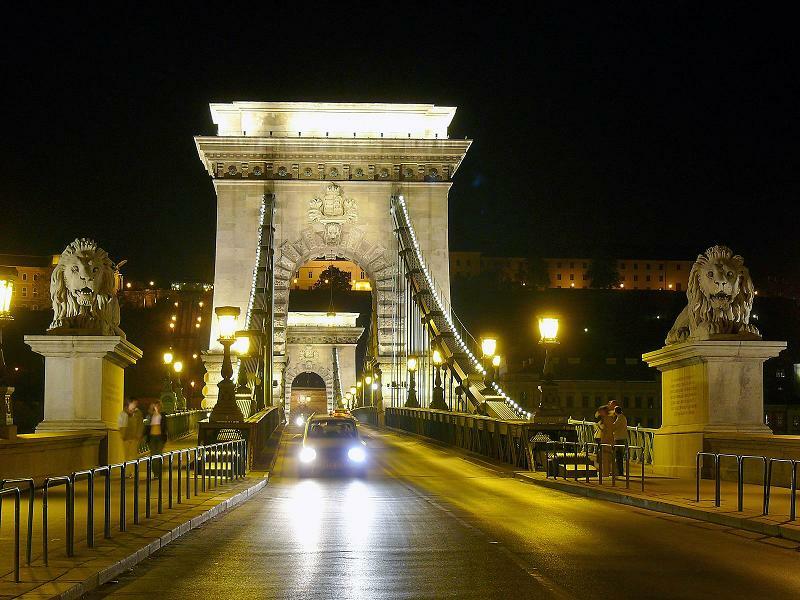 Andy Mossack provides the answer with his insider’s guide to the 13 top things to do in Budapest. I know I’ve already touched on this, but the locals really do take it seriously. The mineral packed thermal waters are said to have healing properties for all manner of ills and a two hour soak is a basic requirement. So take a lazy morning and let your joints rejoice in a warm thermal marinade at the famous Szechenyl Public Baths, and why you’re at it take a massage too. Bear in mind though that during the week the baths have designated male and female days, whilst at weekends mixed bathing is allowed. Gellert baths are also worth a look. 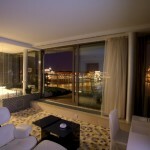 Buda and Pest are connected to each other by no less than eight bridges but there is one which is worth a mention. The Chain Bridge was the very first crossing point in Budapest, and was designed by Scottish engineer Willie Clark in 1839 and you can see a smaller version of it over the Thames at Marlow! At the time, it was one of the largest bridges in the world and it’s still an imposing sight, but take a look at the two lions at each end. Look familiar? They are replicas of the lions in Trafalgar Square but these have no tongues! Lit up at night, with the castle behind, the bridge is a sight to savour. Buda Castle and the whole Castle District is UNESCO World Heritage protected which is just as well as it has three churches, six museums and of course the former Royal Palace, the scene of countless battles since the 13th century. In fact, the whole district is symbolic of old Hungary and represents how Budapest has been shaped through the centuries. The Matthias Church is over seven hundred years old, and nearby, the view of the city from the Fisherman’s Bastion is exceptional, looking out at a particularly lovely section of the Danube. 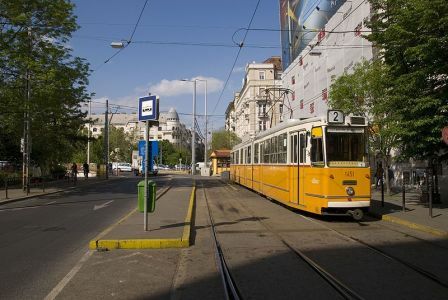 The No.2 tram is a perfect way to see many of the major sights of Budapest as it rolls its way along the Danube on the Pest embankment. From its northern terminus at Jaszai Mariter it passes the Parliament building and then follows the river taking in Matthias Church, Fisherman’s Bastion, the Castle District, Chain Bridge, Elizabeth Bridge, Gellert Hill, the Gellert Hotel and Baths and the new National Theatre and Palace of Arts. Close to Elizabeth Bridge is the Great Synagogue at Dohany utca, the second largest in the world. 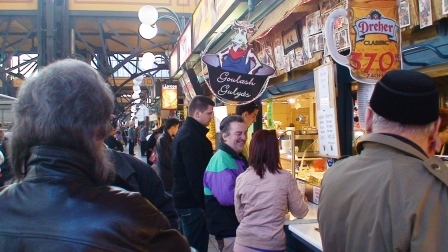 On the way back at the Liberty Bridge, you can pop into the turn of the century indoor Central Market for a slice of fresh food shopping with the locals. Since the 11th century, Margaret Island has been a focal point in Budapest from its origins as the hunting reserve of the royals to the lovely park it is today. Sandwiched between Arpad and Margaret bridges, the island is a haven of tranquillity with no traffic allowed anywhere near it. Rent a bike at the northern end or simply stroll through century old chestnut lined avenues, English, Japanese and French gardens and perhaps even lie on the beach and use the outdoor pool if the sun’s out. You can reach the island by taking tram 4 or 6. Heroes Square is practically the centre of Budapest’s universe. It is where the entrance to the City Park can be found, the weekend venue favourite of the locals. 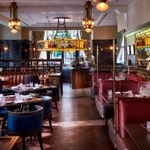 Inside the park you’ll find the zoo, the Budapest Circus, the famous Szechenyl Public Baths, Vajdahunyad Castle and just outside, one of the most iconic restaurants in Budapest – Gundel. The elegant Andrássy Avenue begins at Heroes Square, and some of Budapest’s most spectacular buildings line this 19th century avenue including the State Opera House. There is even a piece of underground history here, as Europe’s first metro The Foldalatti was built by the square and is still in use today over 125 years old. Just look for the descending stairs with wrought iron banisters. 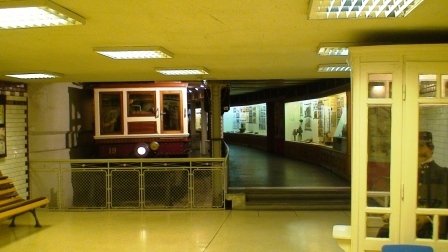 I’ve already mentioned The Foldalatti or the yellow underground line (Number 1) and in the museum at Deak ter Station you can see the carriage that was built for Emperor Franz Joseph when the line was inaugurated in 1896. There is Funicular between the Castle District and Chain Bridge dating back to 1870, the Cogwheel Railway connects Varosmajor and Szechenyl Hill and the Chair Lift is a fun way to get down from Janos Hill to Zugliget. Finally, try out the RiverRide an amphibious yellow coach that gives you a guided city tour by road and then plunges into the Danube for a river tour too! 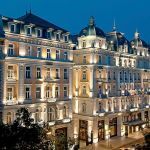 Of course, a regular cruise along the Danube is not to be missed either, and there are plenty of options to choose, from short or day trips to night dinner cruises. There are a few of these strange but brilliant places, they are pop up pubs and clubs in abandoned old crumbly communist era buildings. One of the very best and most popular is Szimpla in the old Jewish Quarter. Every local will know it. Hungarian cuisine is good hearty fare typified by spicy rich stews of which goulash reigns supreme. Whether as a more watered down soup or as a main course, the goulash is considered de rigueur in Budapest. It is a legacy of the many different races that fought and conquered in this part of the world. The Turks, the Magyars, even the Italians and the Hapsburgs were influential. But Hungarian cuisine is not all about paprika and pork fat. There are many examples of contemporary dishes that take traditional recipes and give them a modern twist. There are over a thousand restaurants in Budapest from the starched aprons of Gundel to the more laid back Kisbuda Gyöngye Restaurant in Pest. Whichever you chose you will not leave hungry that’s for sure! Awesome attraction. Take just an oil lamp and wind your way through century old tunnels under the old castle. 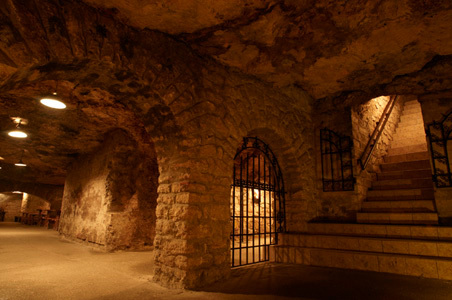 Along the way you will learn about the history of Budapest through wall murals and cavern exhibits. The tunnels were created centuries ago for both defence and escape and for storing all kinds of weird and wonderful things including war munitions. Very creepy but great fun. Best to dispense with the map though! Runs every day except Mondays. The Children’s Railway is located in the hilly outskirts of Budapest, on the right side of the river Danube. 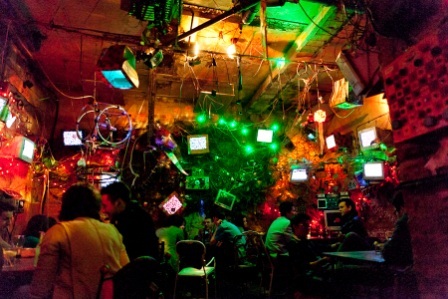 It is operated by children aged 10-14 under the supervision of adults. 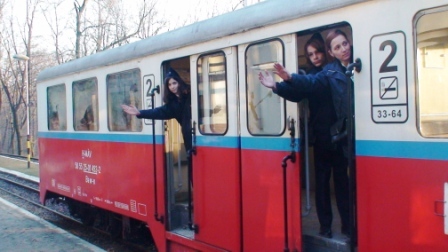 It has been in existence since the end of WW2 and was originally created to honour Budapest children who, by achieving high academic results, get to run the railway for a week! Vaci utca is where the shopping begins and ends in Budapest. Jewellers, perfumeries, designer clothes boutiques and gift shops adorn both sides along with some excellent Hungarian wine shops. 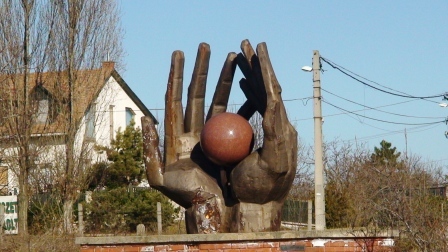 On nearby Jozsef nador ter you’ll find some remarkable Heren porcelain and in the Csok Gallery there are many works of Hungarian art and antiques for sale.